From the glory hole, the provincial government of Catanduanes has retrieved a resolution it used to repel a coal mining in the province four years ago, this time for use against a similar venture that an Australian firm is pressing on. The provincial legislative board recently passed a measure that Gov. Joseph Cua has approved over the week for the revival of a 2009 resolution which strongly opposes mining operations in the province. The move promptly won the support of the local hierarchy of the Catholic Church, with Catanduanes Bishop Manolo delos Santos coming up with a diocese’s position paper reiterating its stance against any mining operation in the province. The paper, according to a report by the local tabloid Catanduanes Tribune, is in consonance with the call made by Bicol bishops to ban mining in the entire region. “Human activity must promote harmony and development that corresponds with God’s plan and in doing so, the sustenance of the people’s current needs and the needs of future generations will be ensured,” the Tribune quoted the Church’s position paper as saying. “It is very clear that there is no justice in sacrificing the survival of future generations of people and living organisms for the short-term gains of a few,” it added. The previous provincial resolution numbered 085-2009 was passed at the height of the controversy over a contract issued four years ago by the Department of Energy (DOE) allowing Monte Oro Resources and Energy, Inc. to mine high grade coal in a vast site covering the Catanduanes towns of San Andres, Bagamanoc, Caramoran and Panganiban. Such resolution prompted the Senate committee on environment and natural resources to hold public hearings on the matter which resulted in social disapproval, forcing Monte Oro to abandon the project. In March last year, the DOE awarded a new coal mining contract to the Australian-owned Altura Mining Limited (ASX:AJM) through its local subsidiary, Altura Mining Philippines Inc. (AMPI), following its successful bid for the first of three Coal Operating Contracts under the Philippine Energy Contracting Round 4 (PECR4). The mining site initially covers 7,000 hectares identified as “Area 3 Catanduanes,” the same site covered by a contract earlier awarded by the DOE under the PECR of 2009 to Monte Oro. The island province, sitting at the eastern seaboard of the Philippines, is gifted with over 1.2 million metric tons (MT) of high-quality coal deposits within an 8,000-hectare land area. When converted to cash based on the prevailing world market price, this volume would be worth P9.4 billion, a recent report citing a US geological survey said. Area 3 Catanduanes straddles the municipalities of Caramoran, Bagamanoc, Panganiban and Viga–all major abaca and coconut producing municipalities that sit at the heart of the 1,511.5 square-kilometer island. The PECR4 bidding process, according to AMPI, was aimed at the development of energy projects to meet the expanding domestic supply requirement as none of the coal to be produced by the firm in the country will be exported. Coal consumption in the Philippines reached over 14 MT in 2011 with almost 11 million tons imported, primarily from Indonesia. The majority of coal is required to feed the country’s eight existing coal-fired power plants and the need is set to expand with the Philippines’ plans to construct seven more coal-fired power plants, AMPI said. In a statement here on Saturday, Cua said Catanduanes’ fragile ecosystem, its location in the typhoon belt, pronounced rainy season and steep slopes make it one of the top 10 provinces most vulnerable to landslides. A recent study on the impacts of coal mining in the province said the 60,000 hectares of forests on the island, the largest green patch in Bicol, could disappear once the AMPI operation is allowed. Cua said the same study revealed that the five-year project timeline on the 7,000 hectares of AMPI in extracting 1.2 MT of coal would provide a share to the province projected at around P76 million with at least 500 local mining laborers to be hired. However, the governor said, the about 1,400-hectare portion of the mining site devoted to abaca and could churn out at least P26 million per year worth of abaca products, benefitting some 9,000 farmers, would be lost to the mining. This means that in five years, an amount of P132 million in abaca production is lost by the province in exchange for the P76-million share from the mining operations. Catanduanes is abaca production leader with its over 20,000 MT of fiber yield yearly representing about 35 percent of the country’s total output. The study also noted that the mining operations will render disturbances on the ground surface, farmlands and vegetation due to massive construction of plant sites and other support facilities. This would result in an increased soil erosion to cause siltation of downstream rivers and creeks which eventually will lead to flooding and landslides in the towns of Viga, Panganiban, Bagamanoc, San Miguel, Bato, San Andres and Caramoran, it said. 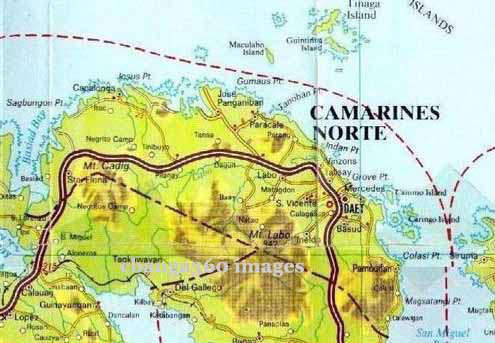 It would at the same time affect the watershed in Caramoran town from where the mini-hydroelectric power plant of Sunwest Water and Electric Co., which supplies three megawatts of renewable energy to the island grid, draws water, the study added. This entry was posted in BICOL NEWS NOW, GREEN, NEWS and tagged Advocacy, Catanduanes, Mining in the Philippines, Rapu-rapu. Bookmark the permalink.